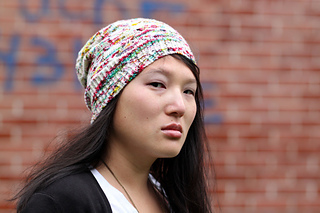 A skein of speckled sock yarn called “Graffiti” inspired me to design this lightweight slouchy hat. 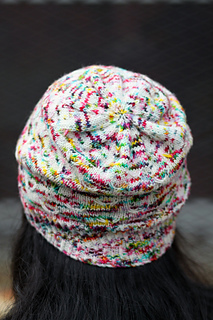 A simple cable adds texture but isn’t obscured by the hand-dyed yarn. The pattern comes in 5 sizes from Baby to Adult Large with both written and charted instructions. 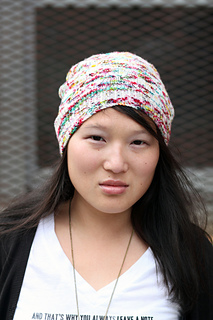 The short-row ribbed brim keeps your ears covered and helps maintain the slouch. 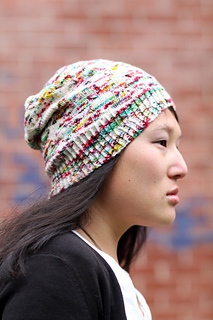 This pattern was tech edited by R. Deborah Overath of scienceknitster werks.